The reference librarians that run the club say there is no-pressure, meaning, you read what you want. Within the next two years, 50% of the U.S. workforce is expected to be made up of Millennials. They are a group known for challenging everything and disrupting traditions. The latest victim? Book clubs. The Mandel Public Library is hosting "Millennials Ruin Book Club" on the third Wednesday of each month at Subculture Coffee on Clematis Street. Tonight will be the third time the club meets, but I went to visit the two nervous librarians, Bethany Oudersluys and Emily Sniegowski, on their first night. "Ummm. Well... We're not sure how many people are going to come. We don't require people to register," nervously says Sniegowski. "I think we are definitely a little bit nervous we've gotten a huge response on social media online. But you don't ever really know what to expect when you're doing a program for the first time. We could have 50 people show up or we could have five," says Oudersluys. The librarians that run the club say there is no pressure, meaning, you read what you want. But that has Gen x’ers scratching their heads on social media and wondering if that’s a bit selfish. 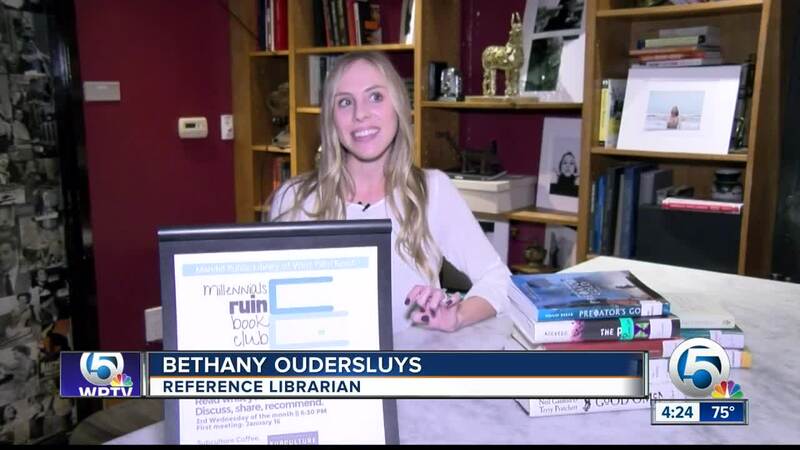 "I don't know that I'd say its selfish, I'd say it's almost less selfish because the more books that more people read the more you get to share them with other people and hear about diverse interests and opinions," says Bethany Oudersluys, Reference Librarian. "People can come and talk about books, they can come and recommend books, what have they liked recently, what have they not liked recently, they can get recommendations from librarians like us, and just chat in general about pop culture," says Emily Sniegowski, Reference Librarian. Five minutes before the club was to start there wasn't anyone there. Then, Natasha Ghataasingh who just moved to West Palm Beach last May, came in and introduced herself to the librarians. Ghataasingh said she came to the inaugural book club meeting because she wanted to find friends in town that had the same interests as her, "When I came in there was another woman here and she was talking about a book she is reading that's on my list. And she was giving me the pros and cons, and what was great about it. And I think its a neat way to bridge ideas between books." Right when the club was slated to start the room filled up and the librarians confidently lead a discussion on literature with about 15 people for the first time. The librarians say they like to host the club out of the library so that it's more relaxed. You can join the two librarians at Subculture Coffee tonight at 6:30 p.m.